On Dec 5/6th 2007 the sky was clear but I put off any comet observing until later in the night when the conditions would be of a higher standard. After an invigorating telephone conversation with John Mc Connell about comets of the past and present I decided to head outside and have another good look at 8P/Tuttle. The sky was dark, T=7-8/10, dry, calm and cold. Using the 8.5" F/7 reflector I began a gentle horizontal sweep within the blank region of sky between Ursa Minor and Cepheus. 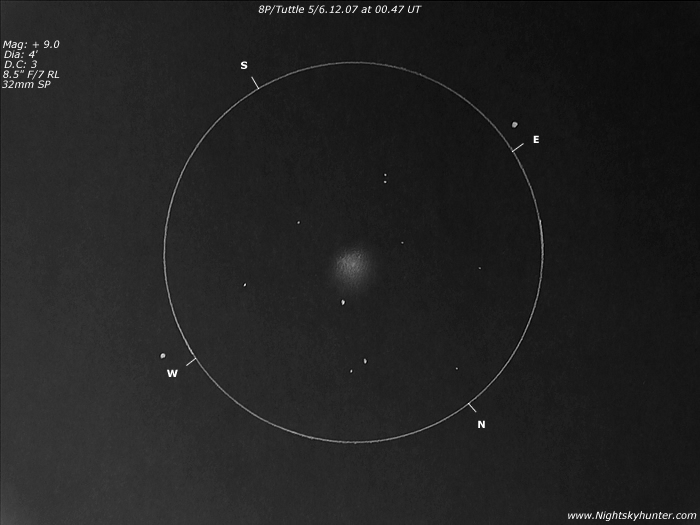 30 seconds later at 00.47 UT I found Tuttle very easily in the low power 32mm eyepiece. It was in Cepheus and not far to the NW of the 'roof' belonging to this house-shaped constellation. Tuttle seemed even more substantial than on my previous observation on the night before. The coma was a green elliptical patch of light with diffuse edges however it looked more 'lively' in profile. At centre was a soft stellar condensation which was now much brighter than I had seen it to date. The comet sat within a dark and sparse field with two bright field stars close by to the north. I decided to have a go using my Bresser 10x50 binoculars and once I could steady my arms by leaning on the side wall of the house I was amazed to see the comet quite readily with averted vision as a ghostly green haze in a rich star field!. No tail was observed however the coma looked larger due to aperture effect. My 4th observation of Tuttle.